I've not been active in the forum for a while, I've had a variety of things to do, but I should be somewhat back for now, and I've brought a new project with me. For context this area covers just under half an A4 sheet, so some of the poor lines are not really that noticeable. 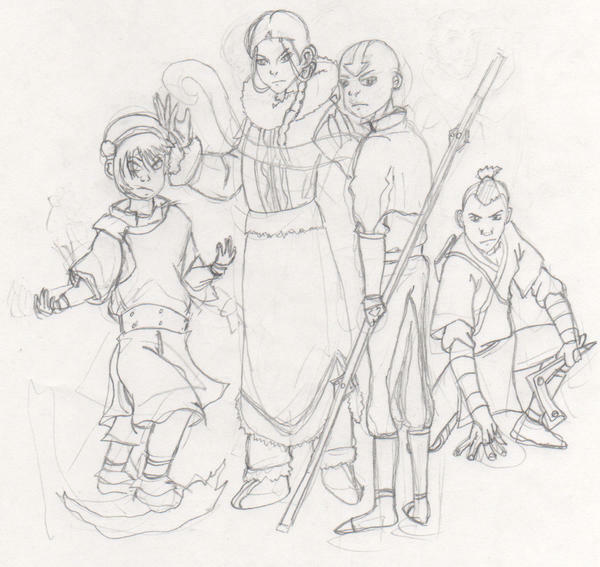 But I know I need to fix Toph's face/eyes, as well as her stance. Basically you can't see it but to the right of Sokka is a big open space, and I'm not sure who to put in it, I plan to put the main characters at the front in a line as you can see and then put a plethora of other characters in the background. So anyway comment and criticisms greatly appreciated and i hope to be updating soon. Welcome back, HNT (Haha, your acronym happens to be the same as Hostage Negotiation Team... I've been watching too many cop shows lately. )! But other than that, I think it looks good. Sokka by far looks like your 'strongest-drawn' character. Love the grim expression and the 'magic stream' between her hands... her left foot needs tweaking, but overall, I think she looks fab! I haven't got any suggestions on which characters to add as I haven't watched much of the show... maybe you can add the bad guy (I think he's Tuko) scowling in the background? And if you've got the time and courage, try colouring it in! Please take my comments as constructive criticism... and keep improving your art, mmkay? I don't think I can provide any more constructive criticism other than what TDIT has already pointed out. Other than those things that need just a little tweaking, I think it looks really superb! I'm not going to colour it instead I'm going for a similar approach to my Bleach (a manga series) picture I drew last year; I'm drawing the characters in the animé style as they appear in the show but I'm going to shade them as if they were real people, I shall see how it turns out. Thedriveintheatre; if you get a chance you really should pick up the first season, once you've watched that there's no way you'll be able to resist getting the other two seasons too! Especially as the second season is somehow better than the first, and the third provides an absolutely perfect end to the series. 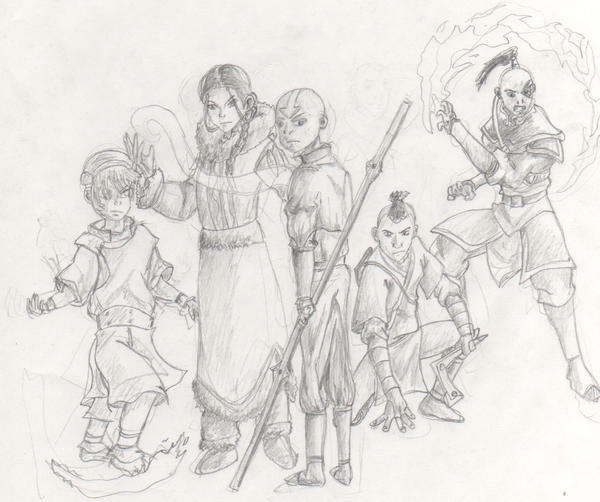 Basically I've just added Zuko and done some minor shading on everyone, as well as fixing some of the wierd bits. It still needs a lot of work but at the moment it's looking pretty good.